Among the Sony and Lionsgate Blu-ray movies I watched, I observed a distinct trend toward images with more noise than I might have expected from a high-definition image; however, other titles, such as Ultraviolet, were sharp and eye-catching. Also at Ultimate Av is a report that the BD-P1000 experiences problems with both Dolby Digital and DTS analog outputs. This can yield reduced channels under Dolby Digital (only the front left and right channels) and either no sound or dangerously high levels of white noise, under DTS. Thus, only the digital sound outputs are really an option. 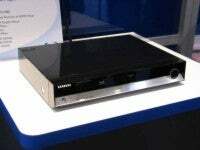 So, though Samsung was first off the boat with its Blu-Ray player, early adopters are paying the price. And at $1000 a pop, some price it is.